The only known photograph of Karl Denke. It was taken after his suicide. Karl Denke (August 12, 1870 – December 22, 1924) was a serial killer from Germany. 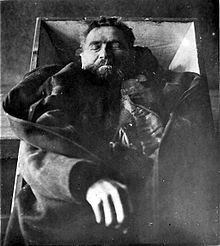 He is one of the most well-known serial killers in Germany in the 1920s. Denke was born in Münsterberg, Silesia in the Kingdom of Prussia (now Ziębice in Poland.) There is not a great deal of information about his early life. As an adult he was well liked in his community. He worked as an organ player at the local church. On December 20, 1924, Denke was arrested after attacking a man at his house with an axe. Police searched Denke's home and found human flesh in huge jars of curing salts. A ledger (record book) contained the details of 30 people Denke had murdered and cannibalized (eaten) over the years. Police thought he sold the flesh of his victims at the Breslau (today's Wrocław) market. The day after his arrest, Denke hanged himself in his cell. His exact motives are unknown and can only be guessed at.